Well, last night I just wanted to play in the studio. I went searching in Pinterest... my favorite place to sit for a long while! 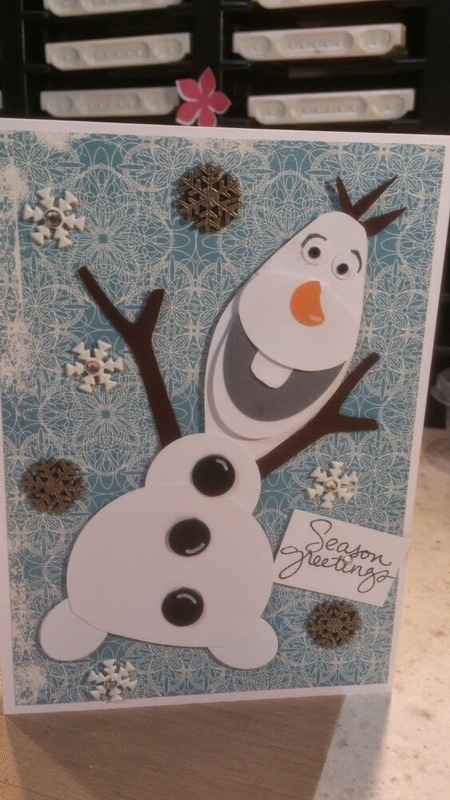 and came across a card with Olaf from Frozen. My granddaughter loves loves this movie, so I thought she would love this card. I watched a video showing which Stampin Up punches to use to make this and well.... here it is. I'll look when I get back up there to get the YouTube and link it here. It was so late I didn't think to do that until now. I can tell you she used the bow die, large and small oval punches, 1/2 inch circle punch and the eyes from the owl punch. I cut the arms and hair out using my Cricut and the Create a Critter cartridge. Hope you're having a great last day of July.... Oh my! Christmas will be here before we know it. Here is a video I did for Cropstop. Hope you enjoy! Designer Series Paper Pack Deal!!!! You only have 2 more days to take advantage of this deal!! 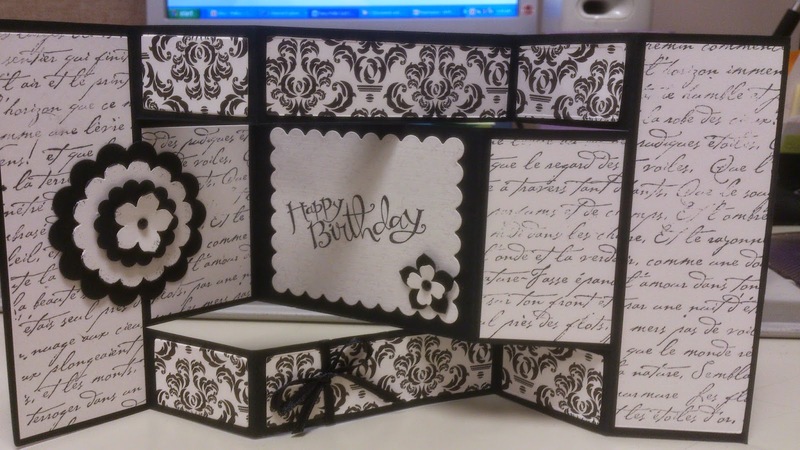 I just got mine yesterday, so watch for some awesome cards and pages using this cool paper! Hope you enjoy this one. Have a great day!! I just wanted to take a minute and let you all know what is going on in our lives right now. Steve and I have been asked to be a part of the ministry at Ambassadors Point, and after much prayer and discussion we have decided to accept this blessing to serve. What does that mean for me and my "hobby job"? Well, the Holiday Open House that I had been planning and had announced has been cancelled. NO! I'm not getting out of Stampin'Up! I love SU and doing classes. But there will be some changes. August 22 Fancy Fold Class stays the same. NO Holiday Open House, however I will be excepting orders from the new Holiday Catalog starting August 28th, and offering FREE SHIPPING! for one week only! So that's August 28- September 4 2014 This will not include online orders, as I have no control on the payment of your order. SORRY! You can call with your order and send a check, if you would like to take advantage of the NO shipping bonus. October 17 All Christmas Cards Stamp a Stack as posted. No class in November- December- January (2015) We will start back up with one class a month to be held on Friday Mornings. No Evening classes are scheduled at this time, that could change. Lots of changes for our family, but ALL good ones. I hope you will all join me in celebrating this great opportunity! We are both looking forward to seeing what God has planned for our future. I just loved this! I know it's been out there a long time but worth another listen.. Have a great day! Just a quick video for you to enjoy! I have 2 openings in the this Saturday's Blast from the Past class, if anyone is interested. The Fancy Fold class is almost full too! Yippee!! I've got my Holiday SU order ready to go..come on August 1st! I'm already getting ready for the Holiday Open House August 29, the Christmas tree is out of the box and awaiting a quick "shake-off-the-dust" LOL I'm so lucky my hubby supports my crafting ideas! Hope you all have a great day!! Make sure to check out the Weekly Deals at Stampin Up! ﻿Well, yesterday Stampin Up unveiled the new 2014-2015 Holiday Catalog! OH MY GOODNESS!! I was able to look at it on line as a Demonstrator and my first wish list totaled over $300!!! I plan to order lots of goodies. 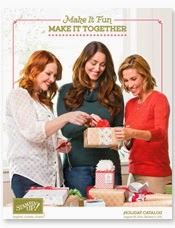 Many of my customers will be receiving their Holiday Catalog in the mail mid-August. Hope you are all as excited as me ... I'm sure you will be once you see the awesome goodies coming soon!!! Thought you would like a close up of the card in the video. Do you do Project life? Where here are some more goodies to add to you book. Click here to get more info and place your order. Check these out! Brand new Photopolymer stamp set. They are too stinkin' cute!!! Well, here's another card from the June card class sample board. I'll have some new samples to share starting Monday from the July class I've asked Steve to help me video my studio for you and he's agreed. Now. to find the time to do that. LOL Have a great weekend. CLASS AND OPEN HOUSE UPDATES!! I wanted to share the updates about my upcoming classes and the BIG HOLIDAY CATALOG OPEN HOUSE!! The new goodies in the Holiday Catalog will be shown on July 17 at convention and being a Demonstrator, I'll be able to start ordering them August 1. I hope to have LOTS and LOTS to share at the Open House. Customers can start placing their orders August 28th. Now, the August 22 class was changed from the Christmas Cards to the "FANCY FOLDS" because the release date for the Holiday Catalog had been changed. I will offer a class in October that will be back to make 12 cards (3 designs 4 of each) for $25 and ALL of them will be Christmas. This will help you get a big jump on your Christmas cards. I will do this again in early November to make sure you at least will have 24 cards ready to send out. 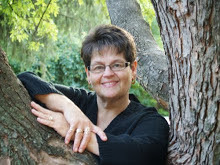 I'm hoping to offer more classes beginning January 2015, as I prepare to retire from the hospital. Yippee!! Hope you all have a great day! Don't forget to mark your calendars and CALL ME!!! 6:00 -9:30 PM AT MY HOUSE!!! I will share new catalogs with those in attendance and you'll have a chance to see lots of the new items that will be available to order. When you place an order ( of $25 or more) on this night, your name will go in the hopper and you will have a chance to win a really great prize!! http://www.stampinup.com/ECWeb/ProductDetails.aspx?productID=138897 This is while supplies last!!! So don't wait. There are going to be lots of "sneak peeks" coming from our new HOLIDAY CATALOG! As I get them I'll be sure to pass them on. Have a great day!!! This is yet another sample I did for the June class. I have all the samples ready for this Friday's class using the Serene Silhouette's set. I start sharing those next week. Hope you are having a good day! Make the holiday season even more beautiful with the new Beauty of the Season stamp set from the upcoming holiday catalog. You can order this starting today HURRY!! I've already ordered mine. http://www.stampinup.com/ECWeb/ProductDetails.aspx?productID=135776 Have a great day! This is a quick and easy card made using the Happy Watercolor stamp set from Stampin UP. I love easy cards that look like it took a lot to make them. Hope you all had a great 4th Holiday. Lots of new goodies to share in the next few days. Have a great day! I was resting after a day of being in the New Richmond parade, grilling out and a trip to the "magic creek" with the grandkids, and hopped over to Pinterest and stumbled on this awesome Youtube video. I LOVED what Brenda did and wanted to share this awesome use of my new all time favorite stamp set Work of Art. You are going to love this. If you don't have it yet you can go to my website and get on the waiting list. YEAP! it's on backorder again…. Honestly it's worth the wait. Hope you had a great like Steve and I did. HAPPY 4th of July Thanks to all our soldiers for making our country a free place to live. BLESSINGS TO ALL!! I thought I would share some of the Stampin Up videos about our Blendabilities . They are NOW available! At least six sets are. Have a good day! Here are a couple more of the card samples for June. I used my all time favorite embellishment… Washi Tape on the first card and the second card I used a card from a set from Michaels for the background. Hope you're having a great day!